Coming Together to Build God’s Kingdom is a recognition that we are the body of Christ. It takes all of us working together to fulfill the mission God has for us here at Fellowship Church. 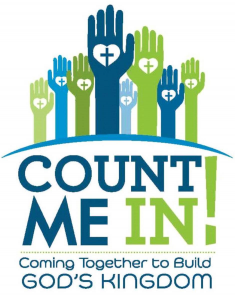 During the month of November we will be asking you to prayerfully consider your commitment to God through your finances and the direct impact that commitment has on our ministry inside and outside Fellowship Church. We will be preparing our 2018 ministry budget based on the funds we can anticipate and we know we can count on you to so that TOGETHER we can accomplish all the great things God has in store for us! Click here to count you in! To access, just text 615.398.4011 from your cell phone and follow the instructions. 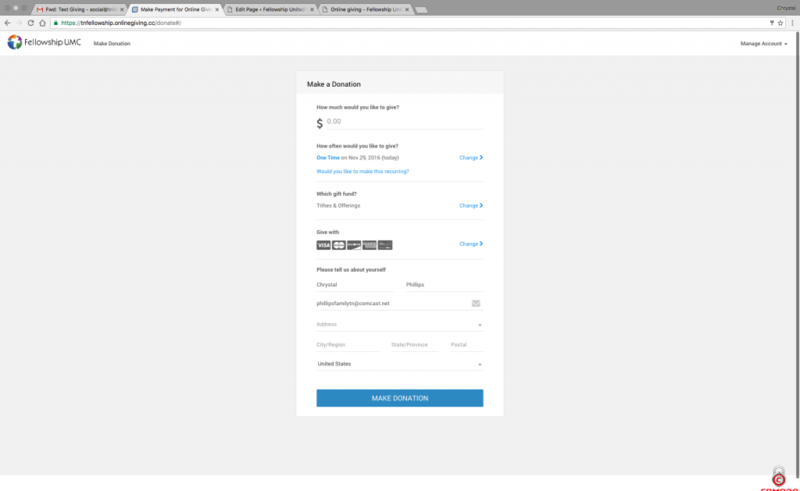 You will be asked to setup a login and password information, as well as banking information. You will only be asked to do this one time. If you sign up to give via text, you can access your account and online giving history through the ONLINE GIVING account manager. You will use the SAME username/password you set up during the initial text! You will be asked to enter your banking information (Please refer to the second & third screenshots for reference – pay close attention to the marked areas on the third screenshot!) . Again, you will only be asked for this information one time. This is the screen you will see when you select to ‘Sign Up’ for an account. 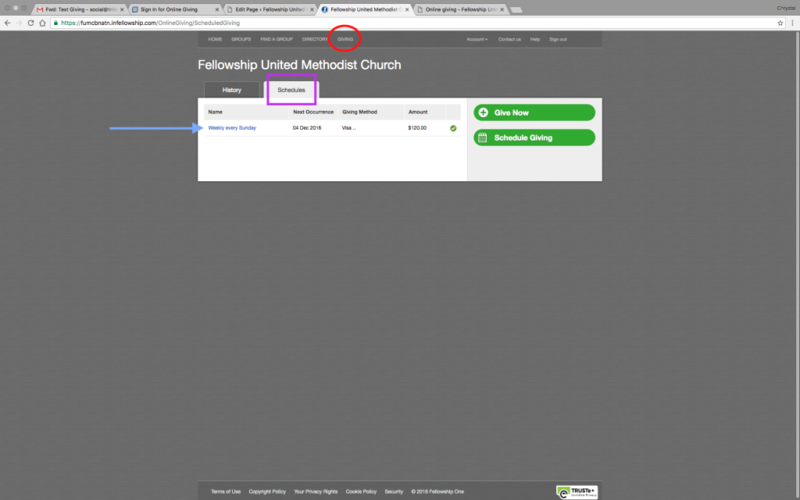 This is where you will set up your recurring or one time tithe amount and personal information. The top is the dollar amount (red), the second area is the occurrence (purple), the third is the beginning date (green), and finally the banking information (blue) is entered. 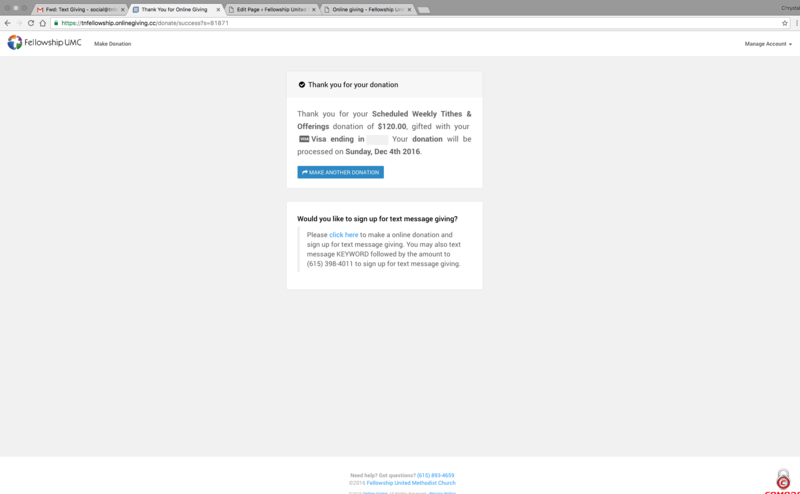 Once you have successfully set up your online giving – you should see a screen similar to this. If you pull the arrow down on the right (orange oval); you can see your account information, like recurring payments. 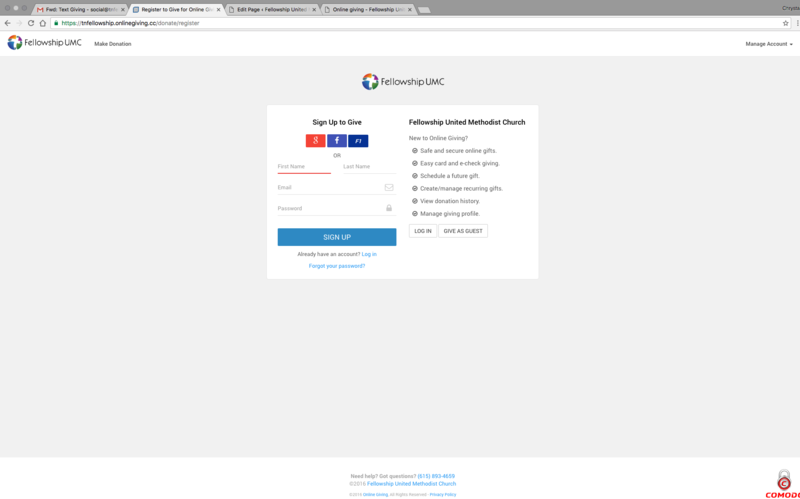 Sign into your FellowshipOne account through the OLD ONLINE GIVING OPTION (See first screenshot below). 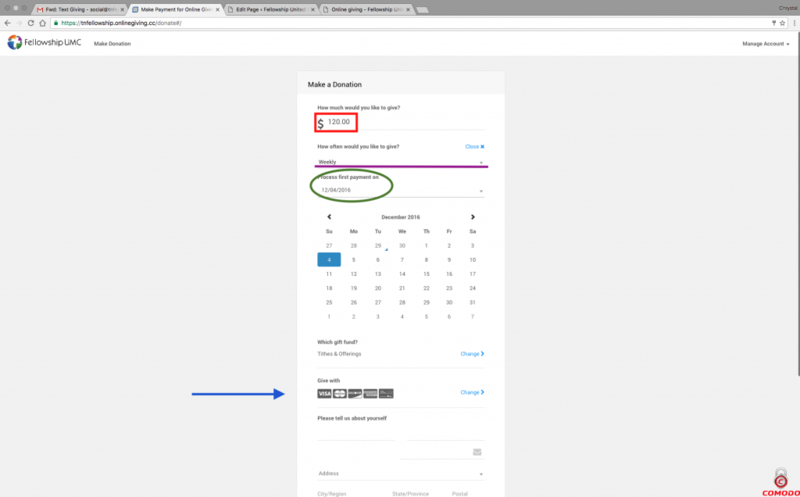 Once you login you will click on ‘GIVING’ (circled in red on the screenshot), followed by a click on ‘SCHEDULES’ (denoted by a purple rectangle on the screenshot), then click on your scheduled giving area (denoted by a light blue arrow). Finally, once you have selected your recurring giving option, select “Delete this schedule” (circled in red on the third screenshot). 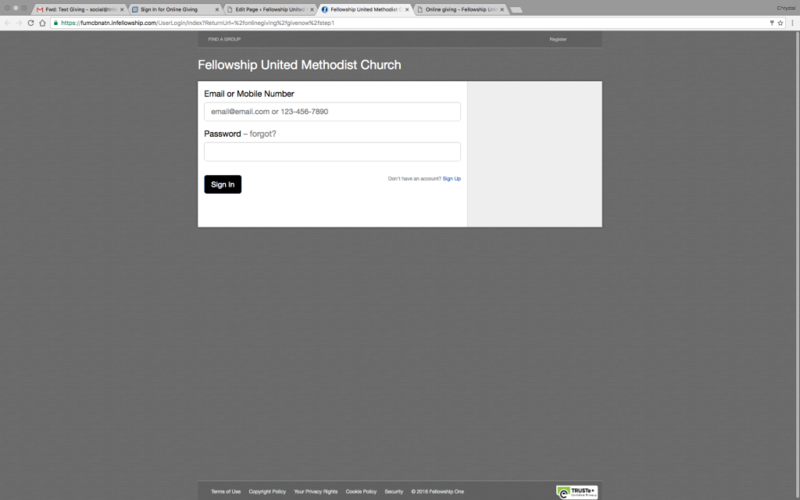 Use your FellowshipOne credentials to login. Notice the three areas highlighted, these are your “Action” Areas. 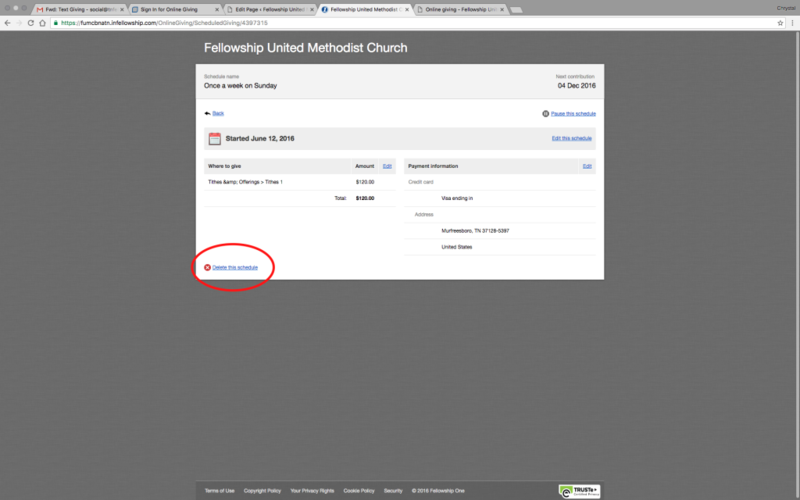 Click on Delete Schedule to remove the online giving in the old system. 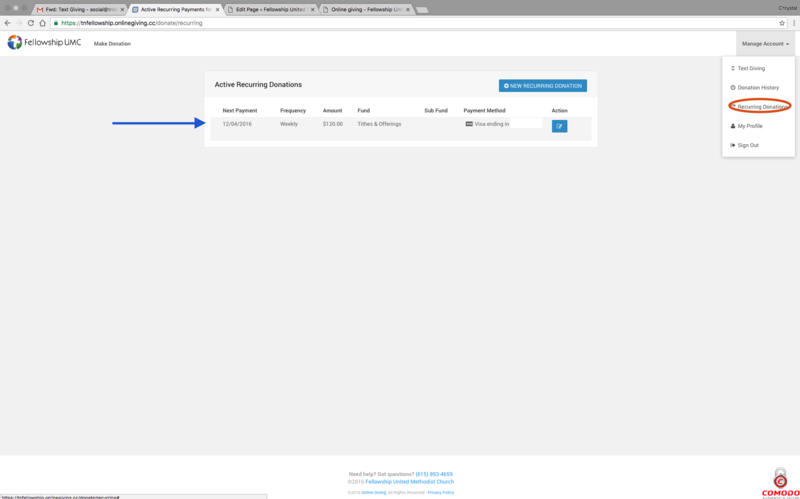 You can schedule new contributions and modify or cancel those contributions at any time prior to the date they are scheduled. Once the contribution has been processed, however, it cannot be cancelled. Questions: please contact the Administrative Office: 615.893.4659. Build the kingdom through your tithes and offering. We all have the honor and the privilege to help build the kingdom. We bring our tithes and gifts to the storehouse so the work of the kingdom can be accomplished. A church is a family where everyone has a unique responsibility as a family member. We all together contribute out of the generosity of God’s blessing. Throughout the Bible we see where God’s people brought their gifts and the work of building the kingdom was accomplished. To understand giving, you must understand that everything you have, 100 percent, is a gift from God. God simply wants you to trust him by recognizing the principle of the tithe (10 percent of one’s earnings is given to the church which is the local storehouse). The Bible is very clear that abundant blessings are directly linked to the financial obedience to God.